Examining painted books and the pictographic writing system of the Aztecs and their neighbors, Professor Boone will discuss how the painted figures and images work with different spatial structures to convey information. In particular, the lecture will reflect her recent interest in the way the flat surface that supports the images is an active field that charges the marks with distinct meanings and thereby shapes the message. ‌Elizabeth Hill Boone is Professor of History of Art and Martha and Donald Robertson Chair in Latin American Art at Tulane University. 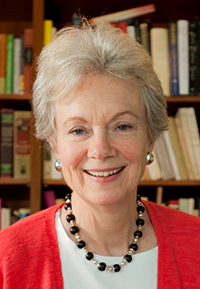 An expert in the Precolumbian and early colonial art of Latin America with an emphasis on Mexico, she is the former Director of Pre-Columbian Studies at Dumbarton Oaks. Professor Boone has earned numerous honors and fellowships, including the Order of the Aztec Eagle, awarded by the Mexican government in 1990. She is a Fellow of the American Academy of Arts and Sciences and a Corresponding Member of the Academia Mexicana de la Historia. Her research interests range from the history of collecting to systems of writing and notation, and are grounded geographically in Aztec Mexico, but extend temporally for at least a century after the Spanish invasion. She is the author of Cycles of Time and Meaning in the Mexican Books of Fate (Texas, 2007) and Stories in Red and Black: Pictorial Histories of the Aztecs and Mixtecs (Texas, 2000), which was awarded the Arvey Prize by the Association for Latin American Art. This seminar will immerse participants in some of the outstanding painted books (codices) from Aztec Mexico, with a particular focus on the divinatory manuals (books of fate). We will review the peripatetic history of one or more codices that left Mexico early in the colonial period and are now held in some of the great libraries of Europe. The focus of the seminar, however, will be on a close reading of the books themselves in order to understand not only how Mexican pictography records information (how it works as a writing system) but also how its books hold fundamental conceptions about the supernatural and natural worlds. We will read what the almanacs have to say about our fates.